Memyou Bosatsu is mostly shown sitting on a horse, with six, four or two arms. He holds various things in his hands, for example scales and thread or a reel. These things are essentials for the silk production. He is also sourrounded by attendants, sometimes of Chinese form and robes. This temple dates back to Gyoki Bosatsu about 1270. It helps with eye diseases and for diseases of women. It protects children. When the hunters of Tono could not decide where to go, they followed the path their horse would lead them - oshirase お知らせ. Later this deity would also make an announcement before an earthquake, fire or other calamity. Statues are placed in the Tokonoma alcove of the best room. In another story the farmer's wife works in the fields when the rain starts. Coming home she finds the washing, which was hanging outside, now safely inside the entrance and the Okunai-sama has a wet robe. People never eat meat in front of the statue. Legends of Tono - Iwate - Tōno monogatari . O-Kaiko Sama is especially popular in Northern Japan and the Kanto area around Tokyo. Its origin goes back to a farmer's wife in Nagano prefecture, Shimo-Ina village, who went to sell her silk cocoons and prayed to this god on her way to town. 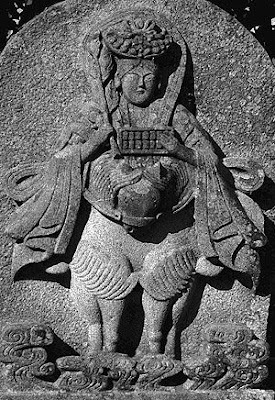 This "Silk God" became more important than many of the old "Farm Gods" and local "Earth Gods". Especially the wifes of silkworm farms prayed to "The White God", o-shira sama (オシラ信仰). During the year, many ceremonies in connection with rearing of silkworms were carried out in the villages, for example prayers to the "first and then last silk worm of the season". These ceremonies were mostly led by the local "female shaman" or shrine maidens. The invocative name of the deity changed from area to area. 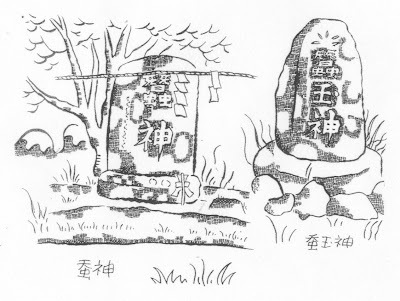 Mulberry Jizo, Mulberry Fudo, Mulberry Kobo and others (桑木地蔵・不動様・弘法神・十六善神) and were invoced for the welfare and good luck of the whole family, a farming community or a whole village community. Sometimes bamboo was used for these figures. They had the form of man/woman or horse/chicken and were clad in many-layered robes called "osentaku" オセンタク. 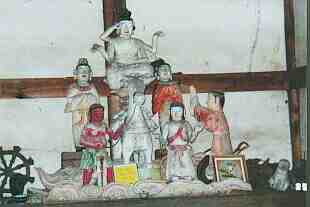 These figures (dolls) were put on the family God shelf or the family Buddhist altar and prayed to every day. "O-shirasama please come" O-Shirasama asobase オシラサマアソバセ. 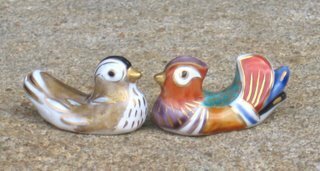 These referred to the famous lovestory of a princess with a horse. Festival days were the 16th day of March and September (or January and December). 1. A man goes off to war, leaving his household. 2. His wife, after enduring her own feelings of loneliness, finally promises that whoever should bring back her husband will have her daughter as a wife. 3. A horse goes and fetches the husband. 4. The horse is killed because it wants to marry the daughter. 5. The hide is spread out to dry. 6. As the daughter passes by, the hide flies up, wraps itself around her, and flies up into a tree. 7. In this way silkworms are produced. A Korean folktale, sometimes known as The Silkworm, tells how silk originated following the King's daughter spiritually marrying a horse, in completion of a promise made in times of trouble. In the tale, the princess was reborn as a silkworm, a creature whose appearance and mannerisms superficially were said to resemble that of a horse. was an immigrant clan active in Japan since the Kofun period, according to the epic history Nihonshoki. ..... The first leader of the Hata to arrive in Japan, Uzumasa-no-Kimi-Sukune, arrived during the reign of Emperor Chūai, in the 2nd century CE. According to the epic, he and his followers were greeted warmly, and Uzumasa was granted a high government position. ..... 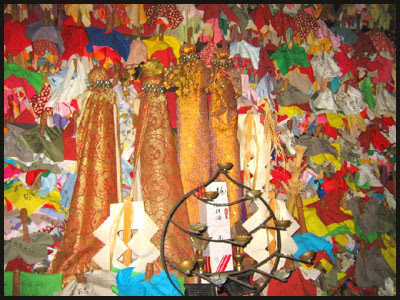 The Hata are said to have been adept at financial matters, and to have introduced silk raising and weaving to Japan. For this reason, they may have been associated with the kagome crest, a lattice shape found in basket-weaving. During the reign of Emperor Nintoku (313-399), the members of the clan were sent to diverse parts of the country to spread the knowledge and practice of sericulture. and is adored by many sericulturists, because one of the internal auxiliary shrines, Kokai Jinja (蚕養神社), which was established by Hata-uji, enshrines the deities of silk raising. Hata-uji was known to be adept at silk raising and introduced it to Japan. 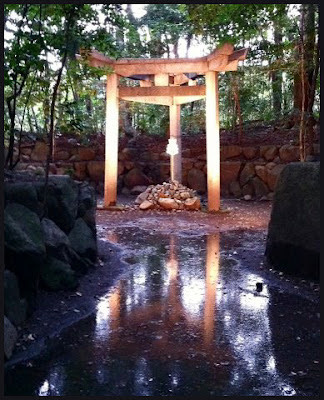 Three-pillar Torii is a rare case as a shinto Shrine's Torii. A few shrines have it, but most of them are very new and just copied Konoshima's one. I think only one shrine having the three-pillar Torii, Wadatsumi Jinja (和多都美神社) in Tsushima Island, is ancestrally related to Konoshima Shrine. 2) Both Shrine's three-pillar Torii are immersed into water (pond at Konoshima and sea at the front of Wadatsumi). 3) There is a piles of stones at the center of three-pillar Torii at both shrines.
. Ukemochi no Mikoto 保食命 Deity of Food . As part of Kojiki's account of Izanagi and Izanami's procreation of the kami (kamiumi), Wakumusuhi was, together with Mitsuhanome, one of two kami produced from the urine of Izanami after she was burned while giving birth to the fire kami Kagutsuchi. 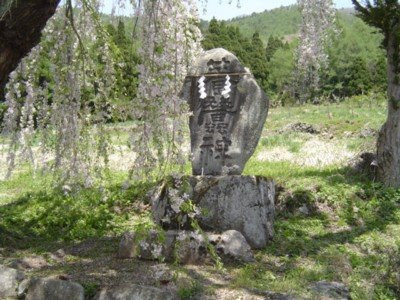 In turn, one of the offspring of Wakumusuhi was the kami of fertility and foodstuffs, Toyoukehime. According to an "alternate writing" transmitted by Nihongi, Wakumusuhi was the product of a union between Kagutsuchi and the earth kami Haniyamabime, another offspring of Izanami (see also Haniyasu no kami). The account goes on to state that the silkworm and mulberry were produced on the child's head, while the five grains were produced in her navel. 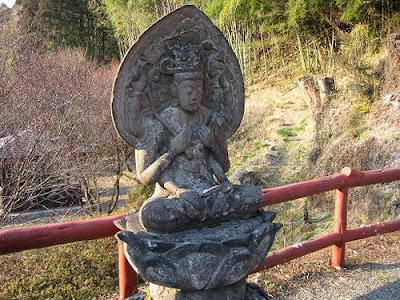 A tutelary of the home (ie no kami) found throughout Japan's northeastern region; also referred to as Oshirabotoke ("the Oshira Buddha"). Although Oshirasama is commonly viewed as a tutelary of agriculture and silkworm production, little agreement has been reached regarding the etymology of the name Oshira and the kami's specific characteristics. The object of Oshirasama worship generally consists of a pair of sticks of mulberry (ocassionally bamboo) about 30 cm long, with male and female faces (or a horse's head) carved or painted in ink on one end. 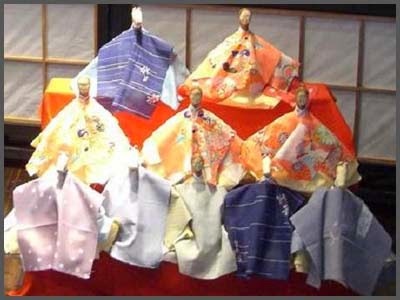 The images are clothed in layers of cloth called osendaku which are added to each year. Many old families enshrine Oshirasama on a kamidana or in the alcove of a main room, and they are also used as ritual implements by religious practitioners such as itako. Devotees of Oshirasama may be composed of individual homes, lineage groups (dōzokudan), geographically linked community groups, and confraternities (kō), but all are characterized by the fact that women play the central roles in the cult. CLICK for Daruma Dolls made from Silk Cocoons ! The light of the household shrine. Als dieser Bosatsu geboren wurde, erhoben viele Pferde in Ehrfurcht ihre Stimme, daher der Name "Bosatsu der wiehernden Pferde". Asvaghosa soll ein bekannter Schriftsteller und Musiker zur Zeit des Königs Kaniska im 2. Jhd. in Indien gewesen sein. Zunächst kritisierte er den Buddhismus, wurde aber schließlich bekehrt und selbst zum Bosatsu. Seine Melodien sollen viele zu Tränen gerührt haben. Einmal hörten 500 Königskinder seine Musik und beschlossen daraufhin, Mönche zu werden. Schutzgottheit der Dichter und Künstler sowie der Seidenraupen~zucht. In Japan besteht eine enge Beziehung zwischen der Seidenraupenzucht und Pferden. Im Anfang der Sage steht der Hochzeitswunsch eines Pferdes mit der Tochter eines Bergbauern. 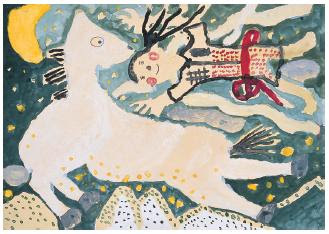 Der Vater tötete das Pferd und die Haut wickelte sich um die Tochter, stieg gen Himmel und es regnete Seidenraupen daraus. Damit begann die Seidenraupenzucht. Bosatsufigur mit weißen Gewändern auf einem weißen Pferd. Sitzt auf einem weißen Lotussockel. Das linke Bein hängt nach unten. Sechs oder acht Arme. Mit Faden, Spinnrad, Rohr oder Waage in den Händen, also Gegenständen der Seidenverarbeitung.
. silk 絹 kinu and related legends . 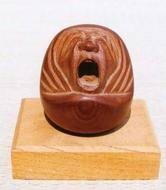 Oshirasama are ritual figurines found in various locales in Tohoku. In Aomori, they are used at times by itako spirit mediums during recitiations of the oshirasaimon ritual chant and entering into a spiritually-enhanced state, in which the mediums may speak for the dead. 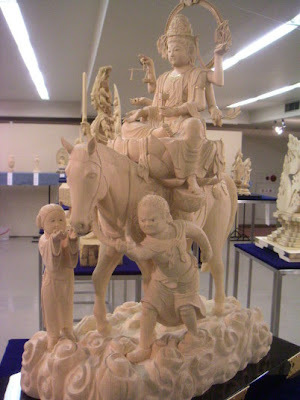 Many oshirasama are owned by individual families, who usualy store them near the family butsudan (domestic Buddhist altar) and who believe that they figurines bring them and their descendants good fortune. 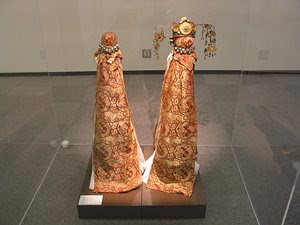 The oshirasama are usually made of mulberry wood cores, wrapped in cloth, often including silk layers with an outer layer of brocade; they are times decorated with metail jewelry and ornaments. The figurines always come in pairs: a male figure represents a mythic horse, a female figure represents his female human-lover. 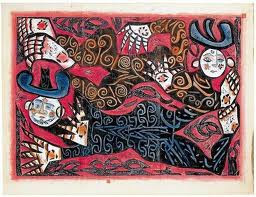 In various versions of the Oshirasaimon mythic text recited by itako mediums, the lovers are killed by the young woman's enraged father. Oshirasama are believed by their owners to like to travel. Some ascetics undertaking shugyo at Akakura carry their family's oshirasama on their backs each day as they climb the mountain, or take on them on the shrine pilgrimages. At the great summer festival many oshirasama-owners bring their oshirasama to attend the morning ceremony; the figurines are stamped with the shrine stamp and are respectfully placed on a rack in the rear area of the complex, near the Honden (kami sanctuary). but Bosatsu's got six arms..
That's much different from the Theravada Buddhist jewelry we have here in Thailand. We've found nothng like what you have here though! O-Shirasama 王志羅（おしら）さま. A fire ritual in his honor is held in May. koma 駒 is another spelling for uma 馬 horse. The hall 駒形堂 Komagata Do could be seen from boats down the river Sumidagawa, looking like a white horse running, koma kake　駒駆け.